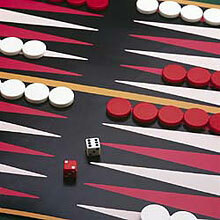 There are a number of different, basic, and easy approaches to winning at Backgammon. It may not always be the best idea to charge forward 100% and hit your opponent at every opportunity. Many newcomers may also have a tendency to avoid being hit at all costs which also has its downsides. In the list and descriptions below, you will find a selection of different aspects of the game which need to be considered when determining your general approach. It will be to your advantage to familiarize yourself with the concepts and constantly re-evaluate during the course of your games. Distribution is how evenly your checkers are spread around the board, and whether they are placed in advantageous positions providing the highest amount of options for each dice combination. A player with even distribution will often appear to get lucky rolls because he is able to choose the best possible move from a variety of sound alternatives. It is bad distribution to have five or more checkers on a single point as this limits your flexibility and often results in a forced play. Beginners worry a lot about leaving shots. Any professional will tell you that leaving shots, however, is absolutely essential when trying to establish a particular type of game but you need to consider when and where will be the best to leave them. Be careful when your opponent's home board is strong or has such potential. The more points that are made in his home board, the more difficult it will be to escape. Less risk are involved leaving shots early in the game. On the other hand, if you have made several points in your home board, you have the benefit of being able to play more aggressively. Preserve your lead and keep your opponent out of the game. If you are ahead in the race, try not to expose any blots. Running is only suggested, however, when you already have a substantial pip-count lead, or at the initial of the match where you roll good numbers (for example double-5s, or double-6s). If you manage to get good rolls early in the game and are able to escape your back checkers (for example, an opening roll of 6-5 followed by a 6-4, or 6-3) you should immediately launch a `running game`. You have an early advantage in the race, and by continuing to move your checkers forward as quickly as possible, you are hoping to utilize that advantage. Blocking Game is used primarily when your opponent has thrown much better dice than you, and your only hope of winning the game is to keep a few checkers back and wait for a blot, and you want to prevent your opponent from getting out of his home board. Therefore, it is necessary to build a prime which will trap your opponent when the time comes. This strategy is defensive and requires fortunate dice rolls, but never forget that luck is a main factor of the game! The Back Game is not exactly a strategy but more of a last-ditch/Hail-Mary effort to win the game from a notable disadvantage. Your chances of winning from a back game are not great, but it can happen. Setting up a back game involves establishing 2 or more defensive anchors with the purpose of holding the points for as long as possible, causing your opponent to bear in awkwardly and expose a blot. When the blot is hit, the idea is to contain it behind a prime and close out your opponent. The back game can be a very effective way to win a gammon or backgammon if the dice fall in your favor and it is correctly executed. This type of game should be reserved for desperate situations. One of the key strategic positions in backgammon is Anchoring. It simply means establishing a defensive point in your opponent's home board. Anchor placement is essential because it enables you to safely re-enter the board when hit and prevents your opponent from preparing his board for bearing off. It is advisable trying to establish anchors early in the game on the higher points (20,21 a?" also called `advanced anchors`). If you find yourself significantly behind in the race, the lower points (22,23,24) should be targeted for anchor placement. The strategy is to build your home board and wait for a shot. When playing this type of game, two anchors on adjacent positions can be very functional. Communication refers to distributing your checkers within six pips of each other in order to ensure that a checker may be covered at a crucial stage. A wide separation in checkers leads to a weakness which your opponent may exploit to infiltrate your strategy.